Photographs were on display during the Meigs County Fair. 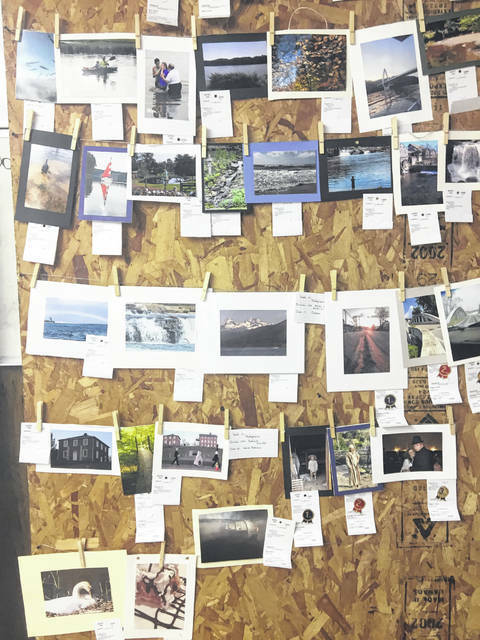 ROCKSPRINGS — Many local photographer took home awards for their entries in the 2018 Meigs County Fair. Division 101-People: Class 1-Individual Portrait — 1st Patricia L. Aldridge, Reedsville; 2nd Alicia Ihle, Racine; 3rd Sharon Dean, Racine; Class 2-Self Portrait — 1st Lisa Short, Pomeroy; 2nd Elizabeth Bird, Racine; 3rd Heather Dailey-Johnson, Racine; Class 3-Real Candid Moment — 1st Heather Dailey-Johnson, Racine; 2nd Cooper J. Schagel, Reedsville; 3rd Peggy Crane, Rutland; Class 4-Friends Having Fun — 1st Sharon Dean, Racine; 2nd Patricia L. Aldridge, Reedsville; 3rd Andrew N. Johnson, Middleport; Class 5-Sports or Action Shot — 1st Andrew N. Johnson, Middleport; 2nd Stephanie A. Lewis, Clifton, W.Va.; 3rd Cooper J. Schagel, Reedsville. Division 102-Landscape: Class 6-Plants and Flowers — 1st Elizabeth Bird, Racine; 2nd Sharon Dean, Racine; 3rd, Cooper J. Schagel, Reedsville,; Class 7-Water — 1st Andrew N. Johnson, Middleport; 2nd Heather Dailey-Johnson, Racine; 3rd Sara Ervin, Racine; Class 8-Morning/Evening — 1st Tom McKay, Long Bottom; 2nd Hannah Damewood, Reedsville; 3rd Alexis Ervin; Class 9-Animals/Insects — 1st Andrew N. Johnson, Middlepor; 2nd Stephanie A. Lewis, Clifton, W.Va.; 3rd Cooper J. Schagel, Reedsville; Class 10-Architecture — 1st Cooper J. Schagel, Reedsville; 2nd Peggy Crane, Rutland; 3rd Sylvia R. Klein, Racine; Class 11-Drone Photography — 1st Cooper J. Schagel, Reedsville; 2nd Brent Rose, Racine; Class 12-Life on the Farm — 1st Tina Karr, Racine; 2nd Heidi Willis, Long Bottom; 3rd Brenda Woodrow, Racine. Division 103-Meigs County Proud: Class 13-History — 1st Peggy Crane, Rutland; 2nd Caitlin Carr, Racine; 3rd Robert Bailey, Long Bottom; Class 14-Pomeroy — 1st Jacob Spencer; 2nd Cooper J. Schagel, Reedsville; 3rd Andrew N. Johnson, Middleport; Class 15-Middleport — 1st Hannah Damewood, Reedsville; 2nd Andrew N. Johnson, Middleport; 3rd Peggy Crane, Rutland; Class 16-Rutland — 1st Andrew N. Johnson, Middleport; 2nd Vicki Taylor, Rutland; 3rd Peggy Crane, Rutland; Class 17-Chester — 1st Cooper J. Schagel, Reedsville; 2nd Peggy Crane, Rutland; 3rd Glenda K. Hunt, Long Bottom; Class 18-Racine — 1st Cooper J. Schagel, Reedsville; 2nd Peggy Crane, Rutland; 3rd Hannah Damewood, Reedsville; Class 19-Reedsville — 1st Lisa Short, Pomeroy; 2nd Peggy Crane, Rutland; 3rd Hannah Damewood, Reedsville; Class 20-Tuppers Plains — 1st Vicki Taylor, Rutland; 2nd Stephanie A. Lewis, Clifton, W.Va.; 3rd Cooper J. Schagel, Reedsville; Class 21-Syracuse — 1st Stephanie A. Lewis, Clifton, W.Va.; 2nd Hannah Damewood, Reedsville; 3rd Peggy Crane, Rutland; Class 22-Meigs County Fairgrounds — 1st Elizabeth Bird; 2nd Brent Rose, Racine; 3rd Brenda Woodrow, Racine; Class 23-Photo Showing What the County — 1st Lisa Short, Pomeroy; 2nd Carol A. Carter, Vinton; 3rd Patricia L. Aldridge, Reedsville. Division 104-Abstract/Fine Art: Class 24-Macro/Micro — 1st Hannah Damewood, Reedsville; 2nd Cooper J. Schagel, Reedsville; 3rd Peggy Crane, Rutland; Class 25-Textures & Patterns — 1st Cooper J. Schagel, Reedsville; 2nd Sylvia R. Klein, Racine; 3rd Peggy Crane, Rutland; Class 26-Single Color — 1st Lisa Short, Pomeroy; 2nd Pamela J. Rose, Long Bottom; 3rd Sylvia R. Klein, Racine; Class 27-Weird Fashion — 1st Sylvia R. Klein, Racine; 2nd Patricia L. Aldridge, Reedsville; 3rd Peggy Crane, Rutland; Class 28-Freestyle — 1st Cooper J. Schagel, Reedsville; 2nd Stephanie A. Rife, Middleport; 3rd Stephanie A. Lewis, Clifton, W.Va.; Class 29-Fine Art Portrait — 1st Lisa Short, Pomeroy; 2nd Vicki Taylor, Rutland; 3rd Brenda Woodrow, Racine. Division 105-Mood: Class 30-Joy — 1st Andrew N. Johnson, Middleport; 2nd Lisa Short, Pomeroy; 3rd Patricia L. Aldridge, Reedsville; Class 31-Melancholy — 1st Lisa Short, Pomeroy; 2nd Andrew N. Johnson, Middleport; 3rd Kim Bolin, Pomeroy; Class 32-Determined — 1st Andrew N. Johnson, Middleport; 2nd Peggy Crane, Rutland; 3rd Lisa Short, Pomeroy; Class 33-Heartbreak/Loss — 1st Lisa Short, Pomeroy; 2nd Olivia Goble, Middleport; 3rd Brenda Woodrow, Racine; Class 34-Victory — 1st Sylvia R. Klein, Racine; 2nd Andrew N. Johnson, Middleport; 3rd Peggy Crane, Rutland. Division 106-Trick Photography: Class 35-Photo Showing Trick Photograph — 1st Caitlin Carr, Racine; 2nd Andrew N. Johnson, Middleport; 3rd Brenda Woodrow, Racine. Division 107-Advanced Pro/Semi Pro: Class 36-People — 1st Cooper J. Schagel, Reedsville; 2nd Olivia Wood, Long Bottom; 3rd Elizabeth Bird, Racine; Class 37-Landscapes — 1st Cooper J. Schagel, Reedsville; 2nd Olivia Wood, Long Bottom. Division 108-Youth: Class 38-Landscapes — 1st Cooper J. Schagel, Reedsville; 2nd Harvest Lechler, Rutland; 3rd Hannah Crane, Pomeroy; Class 39-Picture Showing Fun — 1st Halo M. Rife, Middleport; 2nd Opal H. Huggins, Rutland; 3rd Isaac A. Lewis, Clifton, W.Va.; Class 40-Around the Farm — 1st Halo M. Rife, Middleport; 2nd Isaac A. Lewis, Clifton, W.Va.; 3rd Ruby Lechler, Rutland. https://www.mydailysentinel.com/wp-content/uploads/sites/14/2018/08/web1_8.22-Photography_ne201882195439788-2.jpgPhotographs were on display during the Meigs County Fair.